A Anna Name Mug Made Specially for Me! Name mugs are molded with Anna's name. What could be more special for your child than that? This 10 ounce drink cup is molded in a bright three dimensional (3D) design that has Anna's name molded into it. Mugs come in only one color depending on the name (the color is not selectable). Each mug also includes a Removable Bubble Lid with Matching Straw and Easy Grip Handle. The mug can be used with or without the lid and straw. The mugs are personalized with your child's name. The name appears on both sides of the mug. Mugs are 3" wide and 4.7" tall (6.25" with bubble lid) and holds about 10 oz. of fluid. Mugs are made of 3 dimensional soft PVC and are suitable for cold and warm beverages only. 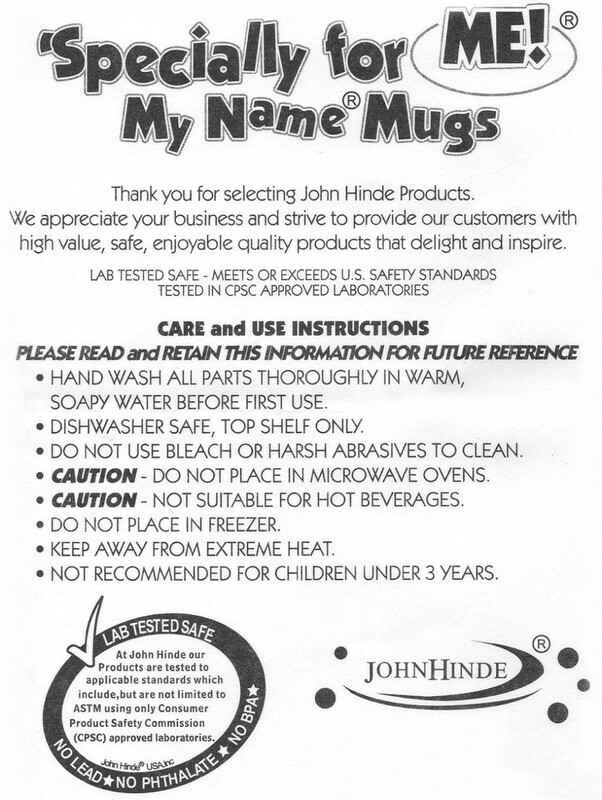 Mugs have been Lab Tested Safe to ASTM, EPA and EN 71 Standards. Click here for a copy of the testing report. Mugs contain No Lead, No Phthalate and No BPA.